The Willoughby WELS-2260 Envy Series Two Station Solid Surface Lavatory System is a contemporary, multi-user solid surface fixture for vandal-resistant commercial use. Willoughby Aquasurf® lavatory fixtures are constructed of Aquasurf® cast polymer resin, a stain-, impact-, and burn-resistant solid surface material. 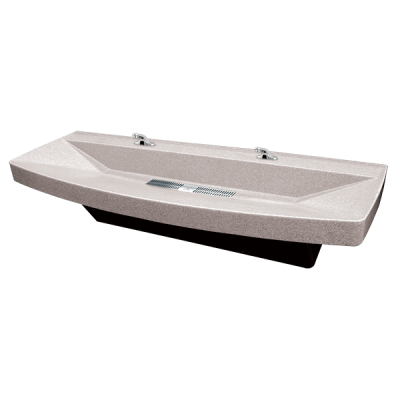 Standard WELS-2260 fixtures come with a contoured multi-user lavatory basin, drain grate assembly, and preassembled stainless steel mounting pedestal with removable shroud and mounting backplate (anchoring hardware and adequate backing by others). The WELS-2260 lavatory system can be supplied with optional faucet hole drilling and/or a wall- mounted stainless steel kick plate (installed by others). All connections between the outside plumbing and the WELS-2260 Envy Series Lavatory System are concealed within the stainless steel pedestal, and the fixture meets all applicable ADA, ANSI, and CBC accessibility guidelines when mounted at the correct applicable rim height above the finished floor. The Willoughby WELS-2290 Envy Series Three Station Solid Surface Lavatory System is a contemporary, multi-user solid surface fixture for vandal-resistant commercial use. Willoughby Aquasurf® lavatory fixtures are constructed of Aquasurf® cast polymer resin, a stain-, impact-, and burn-resistant solid surface material. 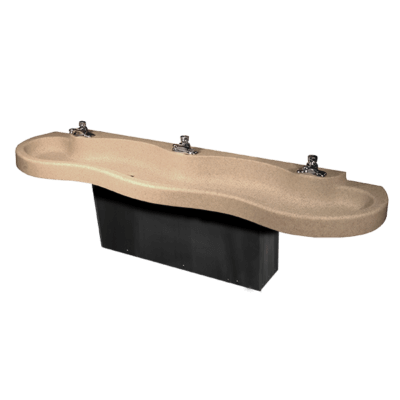 Standard WELS-2290 fixtures come with a contoured multi-user lavatory basin, drain grate assembly, and preassembled stainless steel mounting pedestal with removable shroud and mounting backplate (anchoring hardware and adequate backing by others). The WELS-2290 lavatory system can be supplied with optional faucet hole drilling and/or a wall-mounted stainless steel kick plate (installed by others). All connections between the outside plumbing and the WELS-2290 Envy Series Lavatory System are concealed within the stainless steel pedestal, and the fixture meets all applicable ADA, ANSI, and CBC accessibility guidelines when mounted at the correct applicable rim height above the finished floor. The Willoughby WAF-2200/2201 AquaFount® Corner Mounted Two Station Solid Surface Washfountain is a multi-user solid surface fixture for vandal-resistant commercial use. It can be specified in either Floor Mounted (WAF-2200) or Wall Mounted (WAF-2201) configurations, with an Adult or Juvenile (JR) rim height. Willoughby Aquasurf® lavatory fixtures are constructed of Aquasurf® cast polymer resin, a stain-, impact-, and burn-resistant solid surface material. Standard WAF-2200/2201 fixtures come with a contoured multi-user lavatory basin; drain grate assembly; selected valve, controls, and plumbing; and preassembled stainless steel mounting pedestal (anchoring hardware and adequate backing by others). The WAF-2200/2201 washfountain can be supplied with an optional liquid soap dispenser. 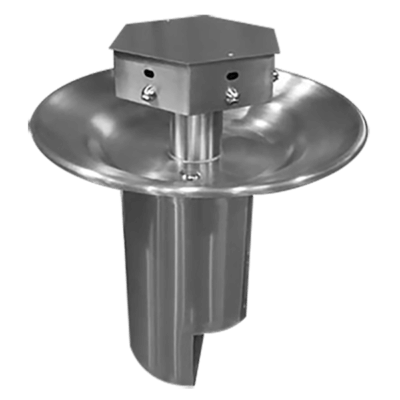 All connections between the outside plumbing and the WAF-2200/2201 AquaFount® Corner Mounted Washfountain are concealed within the stainless steel pedestal. The fixture does not meet ADA, ANSI, and CBC accessibility guidelines. 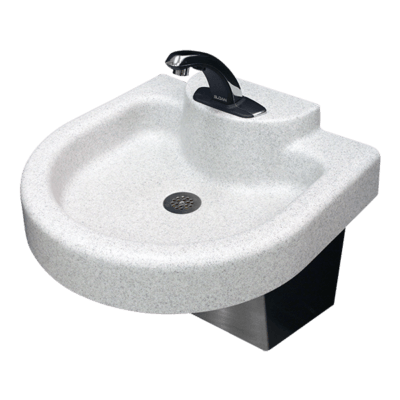 The Willoughby WAF-3300/3301 AquaFount® Three Station Solid Surface Washfountain is a multi-user solid surface fixture for vandal-resistant commercial use. 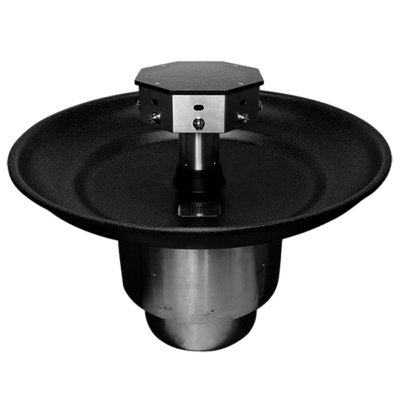 It can be specified in either Floor mounted (WAF-3300) or Wall Mounted (WAF-3301) configurations, with an Adult or Juvenile (JR) rim height. Willoughby Aquasurf® lavatory fixtures are constructed of Aquasurf® cast polymer resin, a stain-, impact-, and burn-resistant solid surface material. Standard WAF-3300/3301 fixtures come with a contoured multi-user lavatory basin; drain grate assembly; selected valve, controls, and plumbing; and preassembled stainless steel mounting pedestal (anchoring hardware and adequate backing by others). The WAF-3300/3301 washfountain can be supplied with optional liquid soap dispensers. 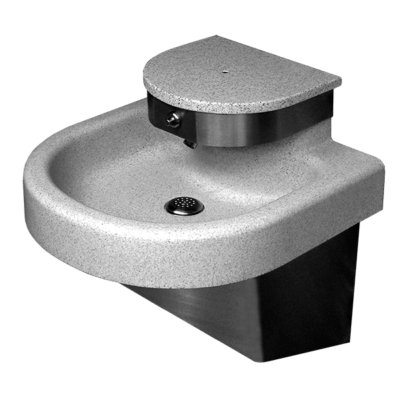 All connections between the outside plumbing and the WAF-3300/3301 AquaFount® washfountain are concealed within the stainless steel pedestal. The fixture meets all applicable ADA, ANSI, and CBC accessibility guidelines when mounted at the correct applicable rim height above the finished floor. 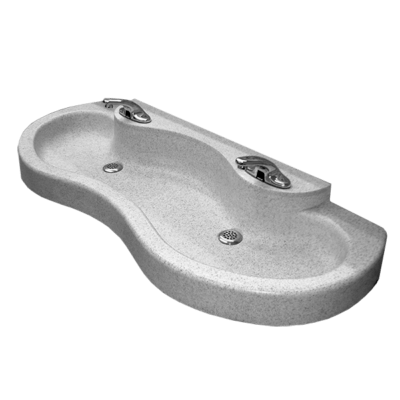 The Willoughby WAF-3603 AquaFount® Three Station, Half Round, 36” Solid Surface Deep Bowl Washfountain is a multi-user solid surface fixture for vandal-resistant commercial use. Willoughby Aquasurf® lavatory fixtures are constructed of Aquasurf® cast polymer resin, a stain-, impact-, and burn-resistant solid surface material. Standard WAF-3603 fixtures come with a contoured multi-user lavatory basin; drain assembly; selected valve, controls, and plumbing; and preassembled stainless steel mounting pedestal (anchoring hardware and adequate backing by others). It can be specified with an Adult ADA or Junior ADA (JR) rim height. The WAF-3603 washfountain can be supplied with optional liquid soap dispensers and/or wall mounted stainless steel kick plate (installed by others). All connections between the outside plumbing and the WAF-3603 AquaFount® washfountain are concealed within the stainless steel pedestal. The fixture meets all applicable ADA, ANSI, and CBC accessibility guidelines when mounted at the correct applicable rim height above the finished floor (excluding FO Foot Operated valve models). 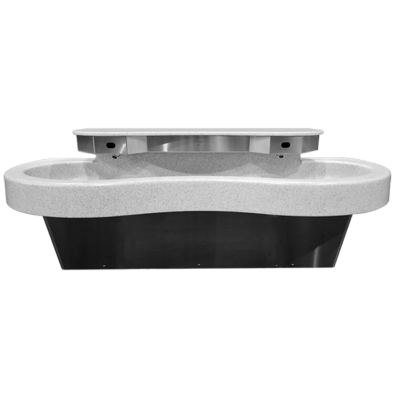 The Willoughby WAF-3606 AquaFount® Six Station, Full Round, 36” Solid Surface Deep Bowl Washfountain is a floor mounted, multi-user, solid surface fixture for vandal-resistant commercial use. Willoughby Aquasurf® lavatory fixtures are constructed of Aquasurf® cast polymer resin, a stain-, impact-, and burn-resistant solid surface material. Standard WAF-3606 fixtures come with a full-round multi-user lavatory basin; drain assemblies; selected valve, controls, and plumbing; and preassembled stainless steel floor pedestal (anchoring hardware by others). It can be specified with an Adult ADA or Junior ADA (JR) rim height. The WAF-3606 washfountain can be supplied with optional liquid soap dispensers and/or telescoping shroud for fixtures with supplies from above (installed by others). All connections between the outside plumbing and the WAF-3606 AquaFount® washfountain are concealed within the stainless steel head kit and pedestal. The fixture has one station that fully meets all applicable ADA and ANSI accessibility guidelines (excluding FO Foot Operated valve models); the other five stations will comply with most but not all accessibility guidelines. The Willoughby WAF-4400/4401 AquaFount® Four Station Solid Surface Washfountain is a multi-usersolid surface fixture for vandal-resistant commercial use. It can be specified in either Floor Mounted (WAF-4400) or Wall Mounted (WAF-4401) configurations, with an Adult or Juvenile (JR) rim height. Willoughby Aquasurf® lavatory fixtures are constructed of Aquasurf® cast polymer resin, a stain-,impact-, and burn-resistant solid surface material. Standard WAF-4400/4401 fixtures come with a contoured multi-user lavatory basin; drain grate assembly; selected valve, controls, and plumbing; and preassembled stainless steel mounting pedestal (anchoring hardware and adequate backing by others). The WAF-4400/4401 washfountain can be supplied with optional liquid soap dispensers. All connections between the outside plumbing and the WAF-4400/4401 AquaFount® washfountain are concealed within the stainless steel pedestal. The fixture meets all applicable ADA, ANSI, and CBC accessibility guidelines when mounted at the correct applicable rim height above the finished floor. The Willoughby WAF-5403/5404 AquaFount® Three / Four Station, Half Round, 54” Solid Surface Deep Bowl Washfountain is a multi-user solid surface fixture for vandal-resistant commercial use. Willoughby Aquasurf® lavatory fixtures are constructed of Aquasurf® cast polymer resin, a stain-, impact-, and burn-resistant solid surface material. Standard WAF-5403/5404 fixtures come with a contoured multi-user lavatory basin; drain assembly; selected valve, controls, and plumbing; and preassembled stainless steel mounting pedestal (anchoring hardware and adequate backing by others). It can be specified in either Three Station (WAF-5403) or Four Station (WAF-5404) configurations, with an Adult ADA or Junior ADA (JR) rim height. The WAF-5403/5404 washfountain can be supplied with optional liquid soap dispensers and/or wall mounted stainless steel kick plate (installed by others). All connections between the outside plumbing and the WAF-5403/5404 AquaFount® washfountain are concealed within the stainless steel pedestal. 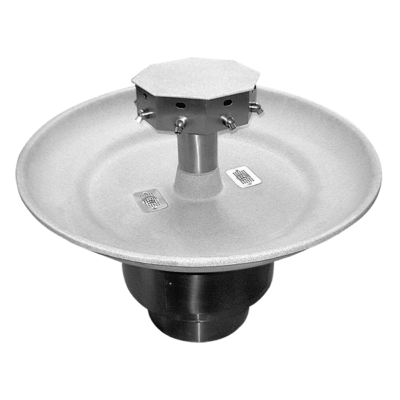 The fixture meets all applicable ADA, ANSI, and CBC accessibility guidelines when mounted at the correct applicable rim height above the finished floor (excluding FO Foot Operated valve models). The Willoughby WAF-5406/5408 AquaFount® Six / Eight Station, Full Round, 54” Solid Surface Deep Bowl Washfountain is a floor mounted, multi-user, solid surface fixture for vandal-resistant commercial use. Willoughby Aquasurf® lavatory fixtures are constructed of Aquasurf® cast polymer resin, a stain-, impact-, and burn-resistant solid surface material. Standard WAF-5406/5408 fixtures come with a full- round multi-user lavatory basin; drain assemblies; selected valve, controls, and plumbing; and preassembled stainless steel floor pedestal (anchoring hardware by others). It can be specified in either Six Station (WAF-5406) or Eight Station (WAF-5408) configurations, with an Adult ADA or Junior ADA (JR) rim height. The WAF-5406/5408 washfountain can be supplied with optional liquid soap dispensers and/or telescoping shroud for fixtures with supplies from above (installed by others). All connections between the outside plumbing and the WAF-5406/5408 AquaFount® washfountain are concealed within the stainless steel head kit and pedestal. The fixture meets all applicable ADA and ANSI accessibility guidelines (excluding FO Foot Operated valve models). The Willoughby WAW-2311 AquaWave® Single Station Solid Surface Lavatory System is a single-user solid surface fixture for vandal-resistant commercial use. Willoughby Aquasurf® lavatory fixtures are constructed of Aquasurf® cast polymer resin, a stain-, impact-, and burn-resistant solid surface material. Standard WAW-2311 fixtures come with a contoured single-user lavatory basin; drain grate assembly; selected valve, control, and plumbing; preassembled stainless steel mounting pedestal; and galvanized steel mounting backplate (anchoring hardware and adequate backing by others). The WAW-2311 lavatory system can be supplied with an optional liquid soap dispenser (installed by others). 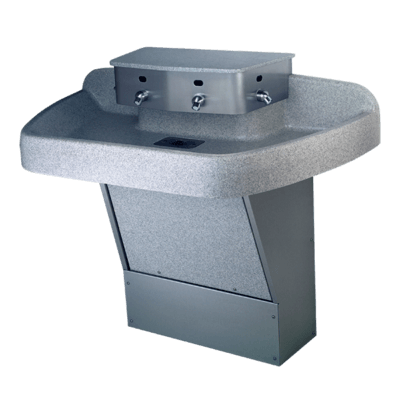 All connections between the outside plumbing and the WAW-2311 AquaWave® Lavatory System are concealed within the stainless steel pedestal, and the fixture meets all applicable ADA, ANSI, and CBC accessibility guidelines when mounted at the correct applicable rim height above the finished floor. 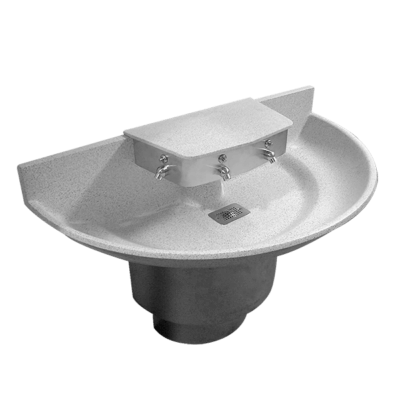 The Willoughby WAW-2311-DMF AquaWave® Single Station Solid Surface Lavatory System for Deck Mounted Faucets is a single-user solid surface fixture for vandal-resistant commercial use. Willoughby Aquasurf® lavatory fixtures are constructed of Aquasurf® cast polymer resin, a stain-, impact-, and burn-resistant solid surface material. 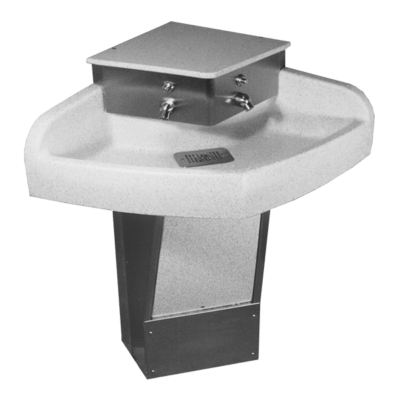 Standard WAW-2311-DMF fixtures come with a contoured single-user lavatory basin, drain grate assembly, preassembled stainless steel mounting pedestal, and galvanized steel mounting backplate (anchoring hardware and adequate backing by others). The WAW-2311-DMF lavatory system can be supplied with optional faucet hole drilling and/or a liquid soap dispenser (installed by others). All connections between the outside plumbing and the WAW-2311-DMF AquaWave® Lavatory System are concealed within the stainless steel pedestal, and the fixture meets all applicable ADA, ANSI, and CBC accessibility guidelines when mounted at the correct applicable rim height above the finished floor. The Willoughby WAW-2322 AquaWave® Two Station Solid Surface Lavatory System is a multi-user solid surface fixture for vandal-resistant commercial use. Willoughby Aquasurf® lavatory fixtures are constructed of Aquasurf® cast polymer resin, a stain-,impact-, and burn-resistant solid surface material. Standard WAW-2322 fixtures come with a contoured multi-user lavatory basin; drain grate assemblies; selected valve, controls, and plumbing; preassembled stainless steel mounting pedestal; and galvanized steel mounting backplate (anchoring hardware and adequate backing by others). The WAW-2322 lavatory system can be supplied with optional liquid soap dispensers and/or wall mounted stainless steel kick plate (installed by others). 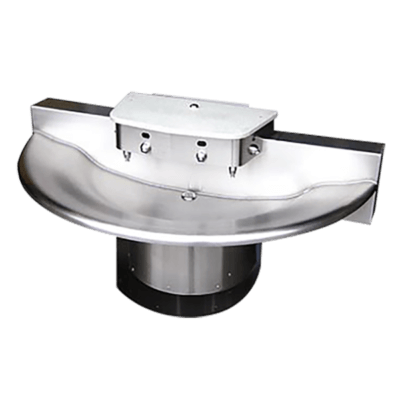 All connections between the outside plumbing and the WAW-2322 AquaWave® Lavatory System are concealed within the stainless steel pedestal, and the fixture meets all applicable ADA, ANSI, and CBC accessibility guidelines when mounted at the correct applicable rim height above the finished floor. 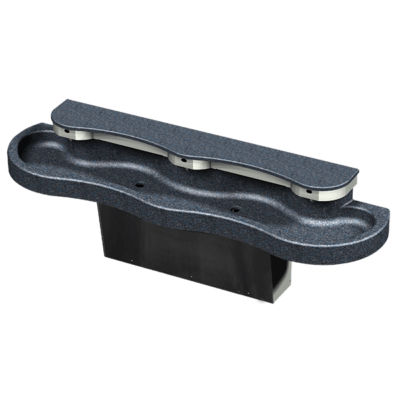 The Willoughby WAW-2322-DMF AquaWave® Two Station Solid Surface Lavatory System for Deck Mounted Faucets is a multi-user solid surface fixture for vandal-resistant commercial use. Willoughby Aquasurf® lavatory fixtures are constructed of Aquasurf® cast polymer resin, a stain-, impact-, and burn-resistant solid surface material. 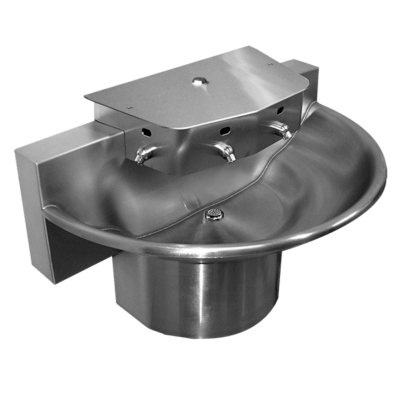 Standard WAW-2322-DMF fixtures come with a contoured multi-user lavatory basin, drain grate assemblies, pre-assembled stainless steel mounting pedestal, and galvanized steel mounting backplate (anchoring hardware and adequate backing by others). The WAW-2322-DMF lavatory system can be supplied with optional faucet hole drilling, liquid soap dispensers, and/or a wall-mounted stainless steel kick plate (all installed by others). All connections between the outside plumbing and the WAW-2322-DMF AquaWave® Lavatory System are concealed within the stainless steel pedestal, and the fixture meets all applicable ADA, ANSI, and CBC accessibility guidelines when mounted at the correct applicable rim height above the finished floor. The Willoughby WAW-2333 AquaWave® Three Station Solid Surface Lavatory System is a multi-user solid surface fixture for vandal-resistant commercial use. Willoughby Aquasurf® lavatory fixtures are constructed of Aquasurf® cast polymer resin, a stain-, impact-, and burn-resistant solid surface material. Standard WAW-2333 fixtures come with a contoured multi-user lavatory basin; drain grate assemblies; selected valve, controls, and plumbing; preassembled stainless steel mounting pedestal; and galvanized steel mounting backplate (anchoring hardware and adequate backing by others). The WAW-2333 lavatory system can be supplied with optional liquid soap dispensers and/or wall mounted stainless steel kick plate (installed by others). 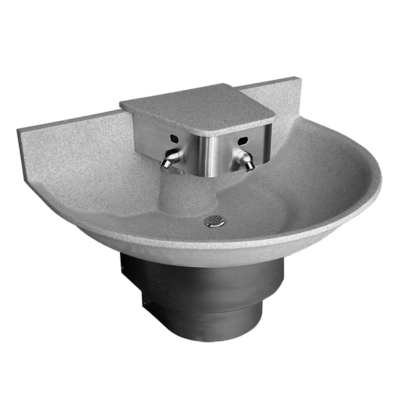 All connections between the outside plumbing and the WAW-2333 AquaWave® Lavatory System are concealed within the stainless steel pedestal, and the fixture meets all applicable ADA, ANSI, and CBC accessibility guidelines when mounted at the correct applicable rim height above the finished floor. The Willoughby WAW-2333-DMF AquaWave® Three Station Solid Surface Lavatory System for Deck Mounted Faucets is a multi-user solid surface fixture for vandal-resistant commercial use. Willoughby Aquasurf® lavatory fixtures are constructed of Aquasurf® cast polymer resin, a stain-, impact-, and burn-resistant solid surface material. Standard WAW-2333-DMF fixtures come with a contoured multi-user lavatory basin, drain grate assemblies, pre-assembled stainless steel mounting pedestal, and galvanized steel mounting backplate (anchoring hardware and adequate backing by others). The WAW-2333-DMF lavatory system can be supplied with optional faucet hole drilling, liquid soap dispensers, and/or a wall-mounted stainless steel kick plate (all installed by others). All connections between the outside plumbing and the WAW-2333-DMF AquaWave® Lavatory System are concealed within the stainless steel pedestal, and the fixture meets all applicable ADA, ANSI, and CBC accessibility guidelines when mounted at the correct applicable rim height above the finished floor. 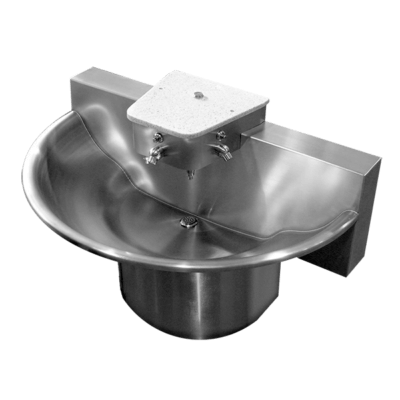 The Willoughby WWF-3603 Three Station, Half Round, 36” Stainless Steel Deep Bowl Washfountain is a multi-user fixture for vandal-resistant commercial use. All WWF-3603 deep bowl washfountain fixtures are fabricated from heavy gauge, Type 304 stainless steel, with all exposed surfaces polished to a #4 satin finish. Standard WWF-3603 fixtures come with an integral, contoured, multi-user basin; drain assembly; selected valve, controls, and plumbing; solid surface head cover; and stainless steel mounting pedestal. It can be specified with an Adult ADA or Junior ADA (JR) rim height, with anchoring through the included Z-clip and mounting holes (anchoring hardware and adequate backing by others). The WWF-3603 washfountain can be supplied with optional liquid soap dispensers and/or wall mounted stainless steel kick plate (installed by others). All connections between the outside plumbing and the WWF-3603 washfountain are concealed within the stainless steel pedestal. The fixture meets all applicable ADA, ANSI, and CBC accessibility guidelines when mounted at the correct applicable rim height above the finished floor (excluding FLR Floor Mounted and FO Foot Operated valve models). 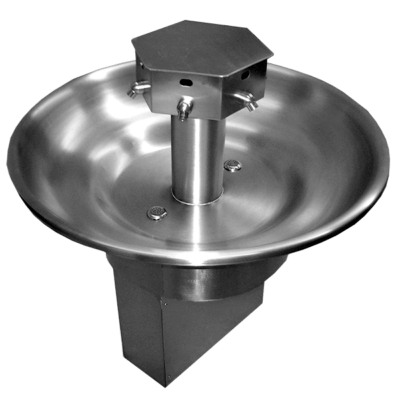 The Willoughby WWF-3606 Six Station, Full Round, 36” Stainless Steel Deep Bowl Washfountain is a floor mounted, multi-user fixture for vandal-resistant commercial use. All WWF-3606 deep bowl washfountain fixtures are fabricated from heavy gauge, Type 304 stainless steel, with all exposed surfaces polished to a #4 satin finish. 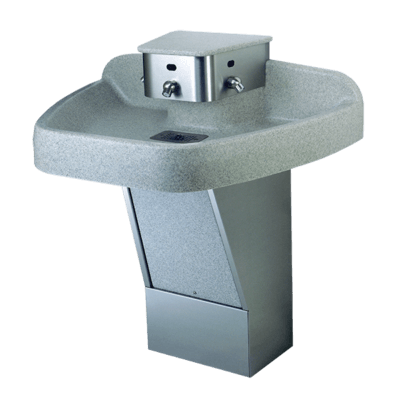 Standard WWF-3606 fixtures come with an integral, contoured, multi-user basin; drain assemblies; selected valve, controls, and plumbing; solid surface head cover; and stainless steel floor pedestal (anchoring hardware by others). It can be specified with an Adult ADA or Junior ADA (JR) rim height. The WWF-3606 washfountain can be supplied with optional liquid soap dispensers and/or telescoping shroud for fixtures with supplies from above (installed by others). All connections between the outside plumbing and the WWF-3606 washfountain are concealed within the stainless steel head kit and pedestal. The fixture has one station that fully meets all applicable ADA and ANSI accessibility guidelines (excluding FO Foot Operated valve models); the other five stations will comply with most but not all accessibility guidelines. The Willoughby WWF-4203/4204 Three / Four Station, Half Round, 42” Stainless Steel Deep Bowl Washfountain is a multi-user fixture for vandal-resistant commercial use. All WWF-4203/4204 deep bowl washfountain fixtures are fabricated from heavy gauge, Type 304 stainless steel, with all exposed surfaces polished to a #4 satin finish. Standard WWF-4203/4204 fixtures come with an integral, contoured, multi-user basin; drain assembly; selected valve, controls, and plumbing; solid surface head cover; and stainless steel mounting pedestal. It can be specified in either Three Station (WWF-4203) or Four Station (WWF-4204) configurations, with an Adult ADA or Junior ADA (JR) rim height. Anchoring is through the included Z-clip and mounting holes (anchoring hardware and adequate backing by others). The WWF-4203/4204 washfountain can be supplied with optional liquid soap dispensers and/or wall mounted stainless steel kick plate (installed by others). All connections between the outside plumbing and the WWF-4203/4204 washfountain are concealed within the stainless steel pedestal. The fixture meets all applicable ADA, ANSI, and CBC accessibility guidelines when mounted at the correct applicable rim height above the finished floor (excluding FLR Floor Mounted and FO Foot Operated valve models). 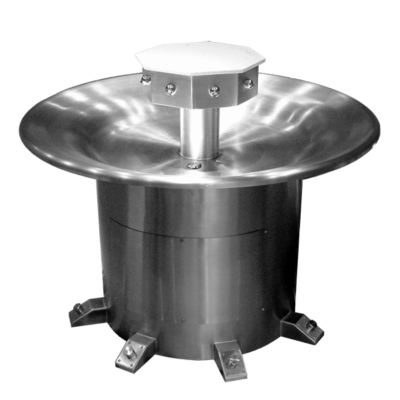 The Willoughby WWF-4206 Six Station, Full Round, 42” Stainless Steel Deep Bowl Washfountain is a floor mounted, multi-user fixture for vandal-resistant commercial use. All WWF-4206 deep bowl washfountain fixtures are fabricated from heavy gauge, Type 304 stainless steel, with all exposed surfaces polished to a #4 satin finish. Standard WWF-4206 fixtures come with an integral, contoured, multi-user basin; drain assemblies; selected valve, controls, and plumbing; solid surface head cover; and stainless steel floor pedestal (anchoring hardware by others). It can be specified with an Adult ADA or Junior ADA (JR) rim height. The WWF-4206 washfountain can be supplied with optional liquid soap dispensers and/or telescoping shroud for fixtures with supplies from above (installed by others). All connections between the outside plumbing and the WWF-4206 washfountain are concealed within the stainless steel head kit and pedestal. The fixture has two stations that fully meet all applicable ADA and ANSI accessibility guidelines (excluding FO Foot Operated valve models); the other four stations will comply with most but not all accessibility guidelines. The Willoughby WWF-5403/5404 Three / Four Station, Half Round, 54” Stainless Steel Deep Bowl Washfountain is a multi-user fixture for vandal-resistant commercial use. All WWF-5403/5404 deep bowl washfountain fixtures are fabricated from heavy gauge, Type 304 stainless steel, with all exposed surfaces polished to a #4 satin finish. Standard WWF-5403/5404 fixtures come with an integral, contoured, multi-user basin; drain assembly; selected valve, controls, and plumbing; solid surface head cover; and stainless steel mounting pedestal. It can be specified in either Three Station (WWF-5403) or Four Station (WWF-5404) configurations, with an Adult ADA or Junior ADA (JR) rim height. Anchoring is through the included Z-clip and mounting holes (anchoring hardware and adequate backing by others). The WWF-5403/5404 commercial hand sink can be supplied with optional liquid soap dispensers and/or wall mounted stainless steel kick plate (installed by others). All connections between the outside plumbing and the WWF-5403/5404 washfountain are concealed within the stainless steel pedestal. The fixture meets all applicable ADA, ANSI, and CBC accessibility guidelines when mounted at the correct applicable rim height above the finished floor (excluding FLR Floor Mounted and FO Foot Operated valve models). The Willoughby WWF-5406/5408 Six / Eight Station, Full Round, 54” Stainless Steel Deep Bowl Washfountain is a floor mounted, multi-user fixture for vandal-resistant commercial use. All WWF-5406/5408 deep bowl washfountain fixtures are fabricated from heavy gauge, Type 304 stainless steel, with all exposed surfaces polished to a #4 satin finish. Standard WWF-5406/5408 fixtures come with an integral, contoured, multi-user basin; drain assemblies; selected valve, controls, and plumbing; solid surface head cover; and stainless steel floor pedestal (anchoring hardware by others). It can be specified in either Six Station (WWF-5406) or Eight Station (WWF-5408) configurations, with an Adult ADA or Junior ADA (JR) rim height. The WWF-5406/5408 washfountain can be supplied with optional liquid soap dispensers and/or telescoping shroud for fixtures with supplies from above (installed by others). All connections between the outside plumbing and the WWF-5406/5408 washfountain are concealed within the stainless steel head kit and pedestal. The fixture meets all applicable ADA and ANSI accessibility guidelines (excluding FO Foot Operated valve models).